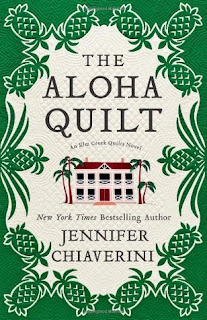 If you enjoy quilting AND you enjoy reading about it as an integral part of a book's plot, than Jennifer Chavierini is the author for you. 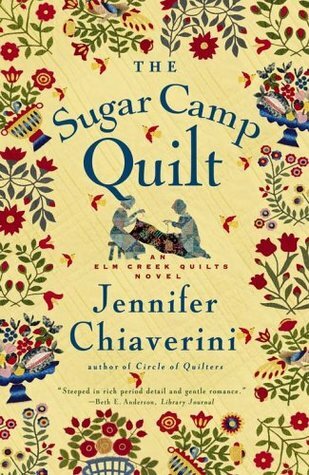 She has written 20 books (so far) in the Elm Creek Quilts series, 3 of which I read in May. As you can see, I did not read them in any kind of order. With the upcoming move, I didn't want to check out any more books from my library, so I had only the books on my last remaining home bookshelf to turn to. Check off three more for my New Year's Resolution! Bonnie, one of the original Elm Creek Quilters, has decided it is time for a change. Her divorce proceedings with Craig have hit yet another snag, and she decides some new scenery and sunshine may be just what she needs to sort things out. Besides, her friend Claire in Maui has been urging her to come for a long time now, to help start up a quilting camp like what they have going at Elm Creek. Bonnie's instincts were right on. Maui was just what she needed to work through her issues. 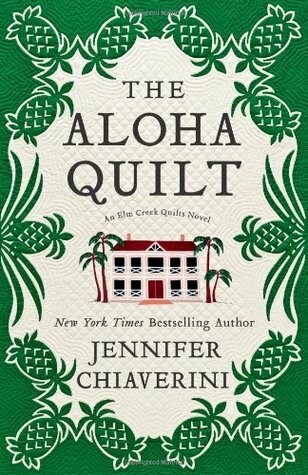 She even has the chance to learn how to make a Hawaiian-style quilt. Maybe I would have enjoyed this one more if I had read more of the series. As it was, it was okay, but not great. Bonnie's predicaments and drama didn't matter very much to me. I found the Hawaiian history and cultural aspects more interesting than the main plot! 3.5 stars: Somewhat predictable, but the characters have depth. Dorothea Granger and her parents live with her Uncle Jacob. They are learning to run his farm, in hopes of getting it from him in his will. Unfortunately, his stern temperament and theirs do not match. They are more dreamers than framers, and he knows it. Dorothea, meanwhile, chafes under uncle's harshness and her parents' compliance. Up until recently, she taught school and thus had an escape for some of the time. However, now there is a new school teacher in town to replace her, since she had no formal training, after all. Rather than being a friend, he is surly and arrogant. She manages to have a little fun with another certain young man from town, despite her uncle's marked disapproval. When Uncle Jacob has her make him a special quilt, for which he himself has designed the blocks, she is confused but does it. It's only later that she comes to understand the significance of the quilt. When tragedy strikes, Dorothea must decide where her loyalties lie. This story was just ho-hum for me until we got to the part about the Underground Railroad. Then it picked up enough to warrant it an extra half star. Dorothea found courage and conviction she never knew she had, and came to view those around her in a different, truer light. 4 stars: Historical fiction told from the perspective of a slave woman. There's a special quilt at Elm Creek, with a history that Sylvia would love to uncover. It's pattern is called "Birds in the Air," and according to family lore passed down through generations, the quilter was a runaway slave named Joanna. When the slave-catchers found her, Joanna made the ultimate mother's sacrifice and left her infant son behind to be raised by her new friends. Light enough of skin to pass as one of their own, nobody was the wiser. Meanwhile, Joanna experienced the hardship and deprivation of slavery once more, being sold even further south as punishment for running. In the slave quarters of her new master's home, down in South Carolina, Joanna is more determined than ever to return to her son. Her skill as a seamstress stands her in good stead as she waits, but the months and then years pass without a chance. She even finds a man to marry amongst the other slaves and starts a family; always sewing, always quilting. Trying to piece her memories of the route into quilt blocks. Of the 3 I read by Chavierini, I enjoyed this one the most. I could relate to Joanna, even with the wide differences in our backgrounds and opportunities. Her courage and determination shone through, despite the desolate plight she shared with the other slaves. I didn't feel that Chavierini romanticized the slaves--they were not all noble and good--nor did she completely demonize the white folk. They all had some good and some bad points, which I appreciated. She did a good job of portraying how even the kind gestures made by a white master or mistress were often self-serving and gave no thought for what it would mean to the slave. One instance, in particular, stood out in that regard. The white mistress thought she was doing Joanna a big favor by bringing her away from the plantation to be her maid in town, when in reality it was devastating, because it caused Joanna to be separated from her family. The connection with the Elm Creek Quilters--eh, I could have done without that. I suppose it was needed to connect it with the series, though. The historical fiction was definitely the stronger portion of the book. Content: Some violence and intense scenes in relation to slavery. Are you a quilter? Do you have any favorites from this series that I shouldn't miss? I probably won't read any more unless they come recommended. Too many other good books on my list to read!